There was one table that Chelsea topped last season where Manchester United didn’t make the top four – the number of Premier League ‘doubles’ achieved within the 2010-11 season. Chelsea did six doubles – winning home and away against six different opponents, with Arsenal, Manchester City and Tottenham on five apiece, and United on four. The 2010-11 doubles table is at the bottom of the page. Double quirks in the campaign included Blackpool’s double over Liverpool, while Liverpool themselves were the only team to do the double over Chelsea. United’s four doubles (a mere four doubles, due to that poor away form by their own standards) was their lowest tally in any of the 19 Premier League seasons, and six fewer than the 10 doubles they gained in coming second the season before. 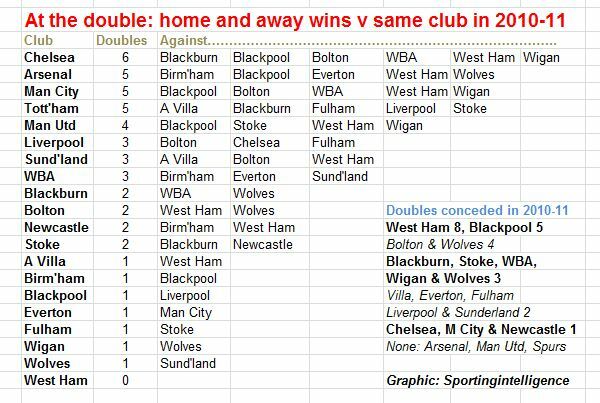 United hold the record the greatest number of back to back doubles against the same team – Wigan. United have beaten Wigan home and away for the past six seasons – all the seasons Wigan have been in the top division. This 12-match winning streak is the longest head-to-head winning sequence in the whole of the Premier League era. There have, so far, been two other runs that have lasted as many as 11 games: Arsenal over Manchester City from 1994 to 2004 (with City not in the Premier League for five of those seasons) and United over Aston Villa from 2003 to 2008.